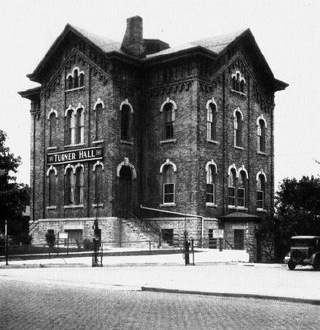 The Elgin Turners Hall is located in Elgin, Illinois at 112 Villa St. It overlooks historic downtown Elgin, the Fox River and is within minutes of the Grand Victoria Riverboat Casino. It is housed in a historic building dating from the early 1870s. The Elgin Turners is a private club but we proudly share our our facility to offer Elgin and surrounding communities with a public Friday night dining option and Banquet Hall rentals for your special events. If you wish to attend any of the events listed in the Member Access announcements you should be accompanied by a Turner member. There are 2 halls on site that are available for public rental for Anniversary parties, Birthday parties, Meetings, Seminars, etc. A planned recreational and social program for all members of the family group and Participation in all worthy civic projects, both Local and National. This website is dedicated to all of the Elgin Turner members, old and new, who unselfishly volunteered their time, talents, and energy, for more than 100 years, to keeping the Elgin Turner family growing strong. This website is for you, the members, so please visit often to watch for new updates and announcements. And if you haven't been down to the club or an event for a while, or you haven't volunteered your time in a while, we sure could use your support. We would love to see you! Interested in Joining the Elgin Turners? Complete an application card (available at the club bar or HERE). You must have two Elgin Turner members in good standing sponsor and recommend you by signing your application card. Upon acceptance into the club, you will notified to attend a general membership meeting to be sworn in and to meet with the membership committee for an orientation, tour, and due information. Volunteer : one who renders a service or takes part in a transaction while having no legal concern or interest.